Jedi Mouseketeer: Walt Disney Family Museum Presents Screening of "Snow White and the Seven Dwarfs"
Walt Disney Family Museum Presents Screening of "Snow White and the Seven Dwarfs"
The California Film Institute has teamed up with The Walt Disney Family Museum to present a screening of Snow White and the Seven Dwarfs, in conjunction with the special exhibition Snow White and the Seven Dwarfs: The Creation of a Classic on view at the Museum through April 14. Relive the enchantment and artistry of this classic film, presented on the big screen in its 75th anniversary restoration at the Christopher B. Smith Rafael Film Center on Sunday, March 10 at 4:15pm. 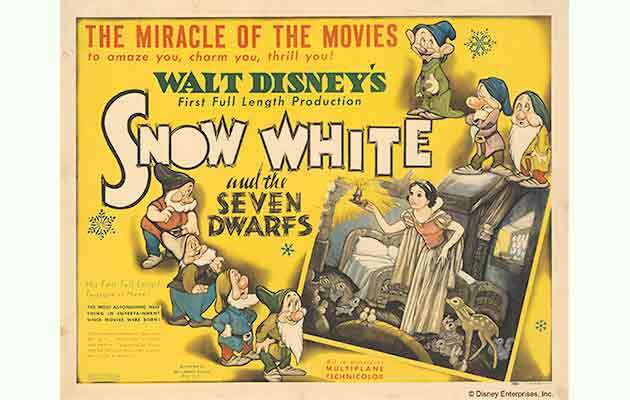 Prior to the film, join Creative Director of the Disney Animation Research Library, Lella Smith, and Disney historian and author, J.B. Kaufman, for a discussion revealing fascinating secrets behind the creation of this masterpiece. Tickets: $9 Walt Disney Family Museum members, CFI members, and children 12 and under. $12 general. Get tickets online or at the box office. Present current Walt Disney Family Museum membership card or proof of membership purchase upon theater entry. Not a member? Join now and take advantage of the ticket discount.